Twitch has long been the home of game streaming online, far eclipsing other major video streaming platforms — even those like YouTube which are otherwise dominant in the field. For all of the games it has played host to over the years though, it's never had its own games. That all changed this weekend just gone, when Twitch released a Karaoke game for free to any and all who want to play it. Twitch Sings was developed in partnership between Twitch and Harmonix, bringing a serious pedigree for rhythm and music games to the table. It has almost 2,000 songs for players to pick from from a wide variety of genres and styles. The idea is that streamers will play it with one another, helping to cross promote different channels, increase viewership, and provide some entertaining moments for viewers. Think of it as an extension of Twitch's already popular IRL, or in real life streaming scene. Just with singing. 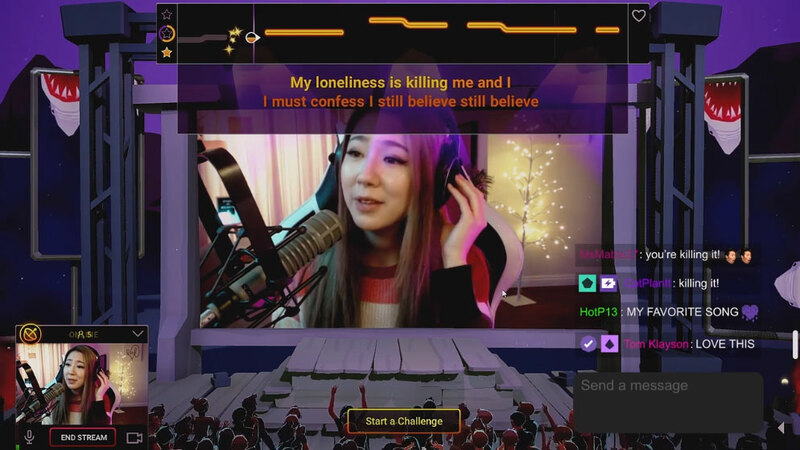 As part of its push to integrate different channels and streamers with fans, Twitch Sings has the option of duets, with asynchronous multiplayer. One person can sing, then save and upload it, with another person then taking that and mixing it with their own streamed footage of them singing the other half. As Kotaku highlights, the game is free to play for anyone who wants to download Twitch Sings (download it here), but Twitch has left the door open to introduce paid-for premium items for the game in the future. At the time of writing there are already 50 live streams and more than 100 recorded videos of streamers playing Twitch Sings. Will you be one of the next to play?